It isn't often that I use the train to go out looking for birds to photograph, but that is exactly what I did yesterday. I live on the north west tip of my Patch and I can usually zoom around it on my bike, but most often I go out on foot. However the alternative form of transport was required today as the birds I was after were just off-Patch. 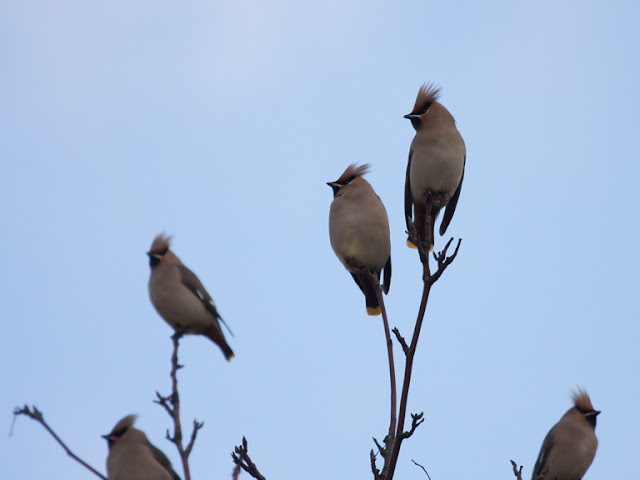 Waxwings have invaded these islands in huge numbers this winter and I have been hoping for a opportunity to photograph them for a couple of weeks. So when I heard of a flock hanging around Hamilton Square I decided to jump on the train and check them out. 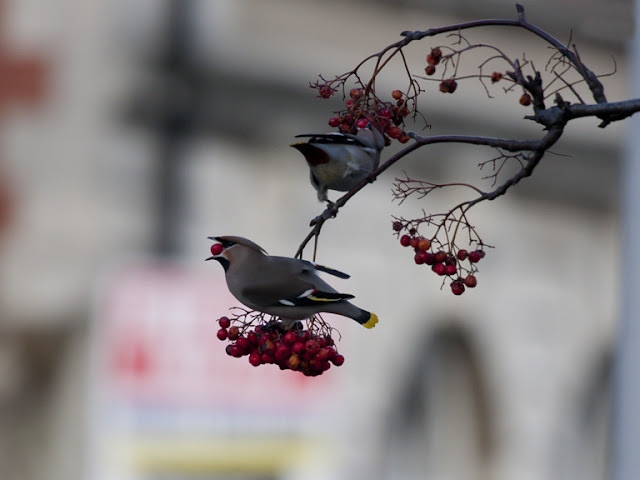 As soon as we arrived (my wife was with me as we had a couple of messages to attend to in the town centre after our Waxwing mission) we came across our birds. I could hear the trilling calls above the taxis, cars and buses that were criss-crossing the Square. We soon located them in the top of a tall tree next to a bus stop. From a distance they looked like the last leaves left on the branches, defiant in the face of the recent cold winds. 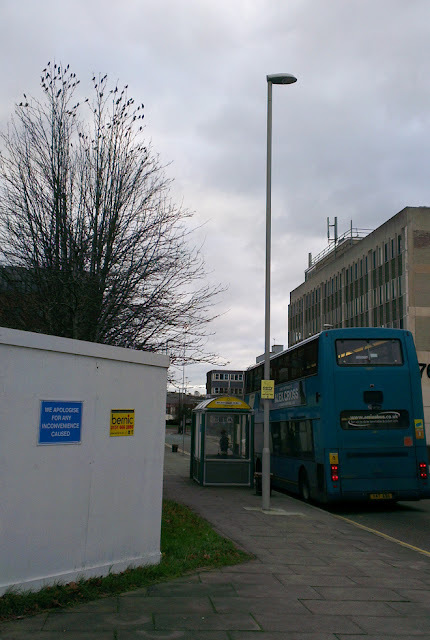 It did appear that they were waiting for the bus! The usual feral pigeons that forage amongst the detritus of the streets have been replaced by birds that appear exotic and they do look a little odd cast against the scaffolds and spires of Hamilton Square. 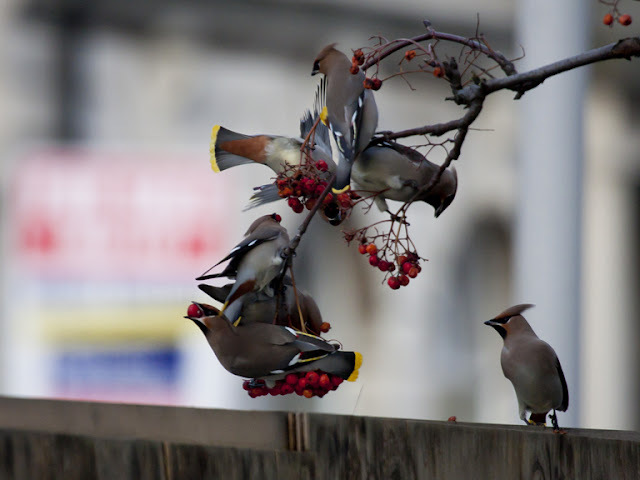 I had been told the Waxwings had been present for a few days and were well used to people and this was immediately obvious. The trees they were feeding on had almost been stripped of berries and the remaining fruit was on the lower branches. The birds were feeding as people walked past, often as close as six feet. They would take some berries and then retreat to their lofty vantage point. I am very much encouraged by this, but almost as soon as I get into a decent position to get a few pictures the heavy grey clouds, sagging from the sky to the west upon our arrival, drift overhead and robs us of the sun. More than a little dissapointed I ramp up the ISO and widen the apperture and resign myself to getting some decent but not great shots. We wait behind a low wall for the birds to come down for a feed. They swoop down in a great noisy crowd, crashing into the remaining berries and guzzling them at breakneck speed. The tree is just a few feet from the pavement and the fence that one of the birds is sat on separates this walkway from a building site. The birds are remarkably tame, the building site is full of noise and action. Shouts between workmen, a clatter of corrugated metal off a flat-bed truck and some sort of metal cutting machine do not stir the birds from their lunch. It is about lunchtime that we arrive and there are many office workers nipping out for a sandwich and passing right under the birds as they feed. A couple of people are curious as to why a guy with a camera is hanging about outside their office. Someone had noticed the birds and had been wondering what they were and why they were here. Whilst grabbing a few frames I explained their origin and reason for travelling here. In the background are the mandatory health and safety signs that must be displayed on the building site, I was trying to keep them out of the pictures at first but in the end I figured that they are a part of the "habitat" the birds are using. 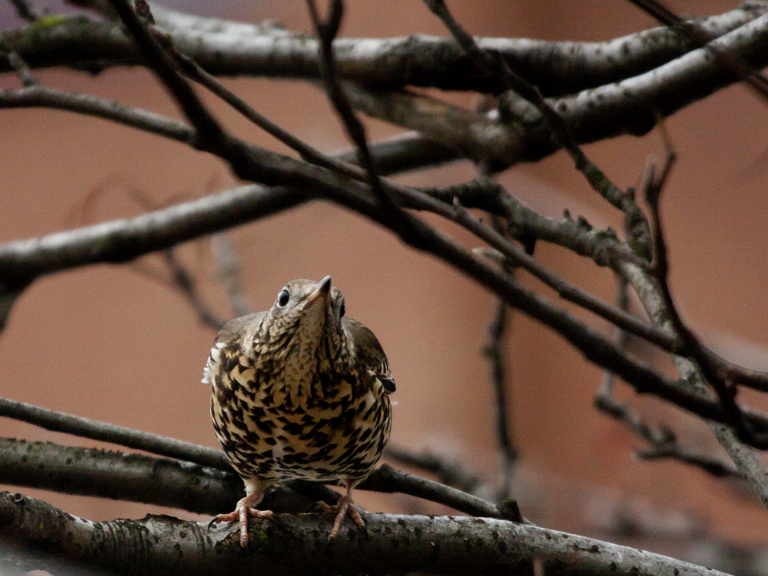 True urban birds, and great to be out birdwatching in an urban environment for a change. However, not everyone is pleased to see these Scandinavian food tourists. Hamilton Square is really rather green. There are formal gardens that are surprising wildlife friendly. I have often seen Goldfinches, Song Thrushes and Mistle Thrushes feeding there. We have been hanging around for a while now and since the sun departed the temperature has plummeted. We are both freezing cold now so my wife volunteers to go to a nearby cafe for hot refreshments. The light is showing no size of improving so I decide to give it 5 minutes and join her in the warm. The birds come down to the tree again just as a group of office workers come around the corner and head in the Waxwings direction. I follow them a few paces behind and as we pass the right under the birds I grab a few final shots in the gathering gloom before joining my wife indoors. 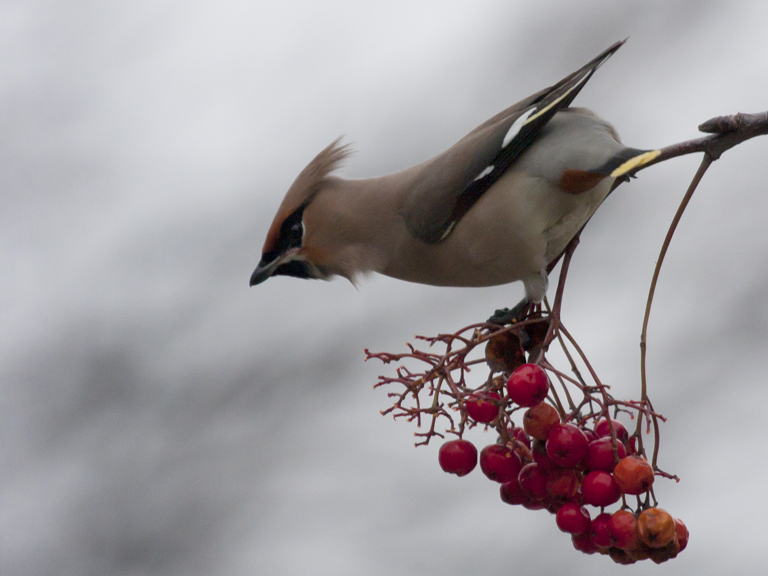 A good start to a Waxwing winter, photos I am reasonably pleased with and a good story to tell. Hopefully I will get the chance to catch up with some more when the sun is out, more train journeys may be required!